The Saugeen First Nation can be found on the shores of the beautiful Lake Huron at the base of the Bruce Peninsula. We are located 2 miles northeast of Southampton and approximately 18 miles west of Owen Sound on Highway 21. Saugeen First Nation is conveniently located within 2 to 3 hours of major centers such as Toronto, Barrie, Kitchener, London and Sarnia. The Ojibway heritage is rich in colour and expression. This is evident in dance, works of art and the hand made craft creations. The public is invited to sample the Saugeen Ojibway’s cultural heritage and experience their gracious hospitality. A visit to the Saugeen Amphitheatre in July or August will allow an opportunity to experience firsthand the Ojibway culture by participating in workshops and other programs. While visiting the community, the visit wouldn’t be complete without a stop at the Little Barn Craft Shop, which carries an assortment of native crafts and art from throughout Ontario. Dancers from across the country participate in the annual Three Fires Confederacy Pow Wow held the second weekend in August in the Saugeen First Nation. Native dance, music, traditional foods, handmade beadwork, quill baskets, black ash baskets and other handcrafted items are featured. The Saugeen First Nation offers opportunities for hiking, fishing and swimming. The Saugeen First Nation Amphitheatre is located in the heart of the village of Saugeen and is one of the most fascinating outdoor theatres in the province. With just under a million tones of limestone and thousand of man-hours, this has been a work in progress since 1971. Adjacent to the amphitheatre are the rock gardens, which are very popular for weddings, photo sessions, art classes or just sitting and enjoying nature. The grounds can be booked for weddings, graduations, or tours by calling the Saugeen First Nation Economic Development office. Visitors are also welcome to hike on one of the nature trails that offer a unique excursion into the unrefined beauty of the area. South Sauble Beach Park is well known for its shallow sandy beach, which makes it a perfect and safe destination for family outing. The park is one of the few beaches in Ontario that allows you to drive on the beachfront for several miles. The park admission gates are open from late June to Labour Day weekend. There is a daily rate per vehicle or a seperate admission fee for pedestrian traffic. Washrooms and change rooms are located throughout the beach for your convenience. Sauble Beach is also renowned for its breathtaking sunsets. 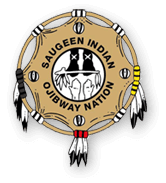 While visiting the Saugeen First Nation you are only a few minutes away from a variety of dining options, golfing, shopping, amusements and accommodations.